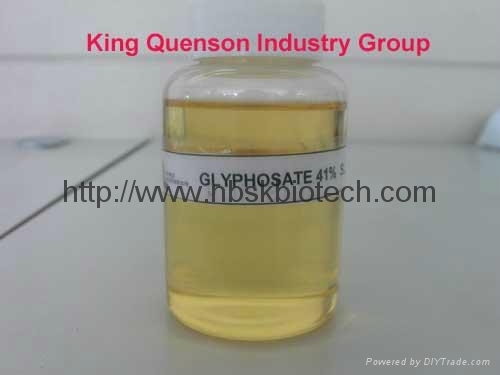 Glyphosate is a non-selective,non-residual herbicide used against annual of biennial herbaceous monocotylendon,herbaceous dicotylendon and perenuial malignant weeds,such as imperater cylin-drica Beuuv,cyperus rotandus linn,etc.Property: Pure glyphosate is a colourless, odourless, crystalline solid with a melting point of 185C and decomposes at 187C producing toxic fumes including nitrogen oxides and phosphorus oxides. Solutions of the glyphosate salts are corrosive to iron or galvanized steel. Pure glyphosate is slightly soluble in water (12 g/litre at 25C), and is practically insoluble in most organic solvents. The alkali-metal and amine salts are readily soluble in water. Glyphosate formulations are stable for extended periods below 60C. Uses: Glyphosate is a broad spectrum, non-selective herbicide which kills all plants, including grasses, broad leaf and woody plants. It is absorbed mainly through the leaves and is transported around the whole plant, killing all parts of it. It acts by inhibiting a biochemical pathway, the shikimic acid pathway. At low levels of application it acts as a growth regulator.